Crystal Guo (in Chinese, Guo Bailing) is a student in the Master of Arts in International and Intercultural Communication at Royal Roads University, Victoria, BC, Canada. Graduating from Tianjin Foreign Languages Studies University in China 2014, she majored in English (international journalism) for her bachelor’s degree. Having studied under an exam-oriented educational system, she has the courage to follow her heart and embrace the diversity of western cultures. Without biased judgment, she is able to understand people, regardless of their different races or religions and appreciate their merits. 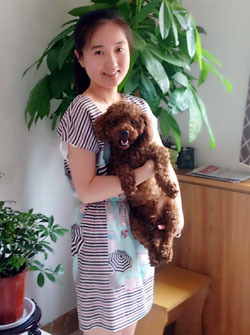 In the process of following her dream to become a media worker, Crystal has actively tried to obtain diversified hands-on experiences through working as a support English teacher in poor western China and through participating in the Work and Travel USA Program in Grand Canyon Resort. She learns quickly and has compelling intellectual ability. She can grasp the essence of theoretical knowledge and apply it flexibly and practically. In addition to that, she has mastered good research techniques to review and assimilate large amounts of complex information in an efficient and effective manner. NOTE: Crystal will be one of several students completing small projects as interns for the CID this year. Her particular project will be to to expand the database of international teaching opportunities. Look for expanded coverage in a few months!